Acupuncture for Alopecia offers men and women who have suffered from these random patches of hair loss a REAL working and effective solution for this condition. In fact, a recent study demonstrated a staggering total recovery rate of 90.32%. In this article I'll share with you the exact details of that study, how acupuncture for alopecia works and how you can easily fix your hair loss! Alopecia areata is an autoimmune disease in which hair is destroyed and lost from some (scalp, beard, etc) or all areas of the body, by the body's own immune system. The disease causes the body to view the hair follicles as foreign invaders and as a result destroys it's own tissue as though it was a foreign pathogen. It displays as small round, or oval patches and as such is also known as spot baldness. It can be limited to small patches or become increasingly systemic so that all hair falls out of the body. Luckily this last, total body hair loss, called alopecia universalis is very rare. The exact cause of Alopecia areata is unknown from a western medical point of view (as we'll see shortly, Traditional Chinese Medicine has long understood and classified this condition). They do know however that it is not contagious, although it is more common in family members suggesting there may be a genetic of hereditary factor. Most doctors and GP's simply suggest it is caused by that vague catch all culprit - "stress". Well, from a western medical point of view, not a whole hell of a lot. Generally they take a "sit back and wait" approach, hoping that the problem will resolve itself. And often it does over the course of a year or so. 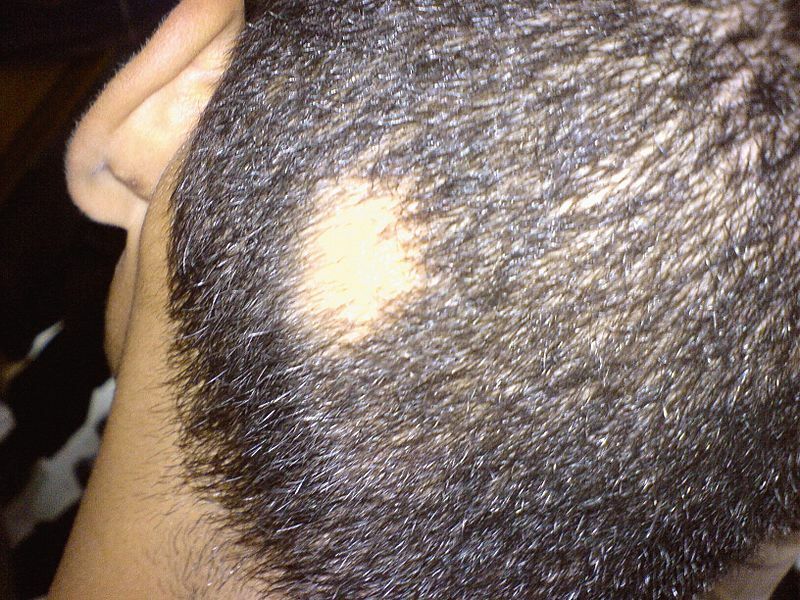 However small patches can link up and ultimately develop into total hair loss of an area and in rare and extreme cases hair loss of the entire body. There has been limited success with using corticosteroids clobetasol or fluocinonide, corticosteroid injections, or creams. The creams and even less successful than the injections. Oral drugs like corticosteroids decrease the hair loss. However ONLY during the period in which they are taken. Far more worryingly though is that these drugs have serious adverse side effects. Luckily, as I said at the start - Acupuncture for Alopecia is a proven and ancient method for resolving this problem with a 90% success rate to boot! Within Traditional Chinese Medicine, Acupuncture for Alopecia has a long record of success. The TCM system views Alopecia. In fact, TCM has been treating Alopecia successfully since the Waring States period (475-221 BC). At this time the concluded that Alopecia was caused by a condition called "Blood Stasis". Without getting into the complexity of the diagnosis, blood is not moving correctly to nourish the skin and hair follicles. There can be many underlying causes for this condition including problems with the Liver, the Stomach and the Kidneys. Traditional Chinese Medicine treats Alopecia using a comprehensive approach, including traditional Chinese herbs, Acupuncture, Nutrition and Chinese Dietary Therapy and life style balance. However in this article I'll concentrate on the 3 best methods for treating alopecia and those most successful in my clinic. Yes!Hair is going from strength to strength which is great and you were right it has thickened up! 1. Eat Blood Building and Blood Nourishing Foods. It's very important for both your immune health and of course your follicle health to be eating the foods that benefit the blood to nourish your folicles and reduce and remove anything that can be causes an auto-immune reaction. All red meat especially bone marrow and liver (beef, pork, sheep) and soups based on meat bone broth. It's always a good idea to strengthen your overall digestive system with lightly cooked and warm foods. We avoid cold and chilled foods and fluids in TCM. Adding some spices to aid digestion such as ginger, cumin, fennel and cardamom and taking them as a tea after eating is also very helpful. Chinese Herbal Medicine is incredible. In fact, many of western medicines more effective drugs are based on extracts from TCM herbs. You can learn more about Chinese Herbal Medicine - here. The best formula for treating alopecia and the one used in the study that produced the 90% success rate is called "Huoxue Shengfa"
This formula is made up mostly of blood building and blood moving herbs. Dang Gui for instance has been shown to help strengthen the immune system and promotes haemopoiesis. It also been proven to regulate blood platelet aggregation and benefits circulation in blood vessels. It's important to fully and properly diagnose the underlying imbalances that can cause Alopecia, and specific points like St-36, Sp-10, Sp-9 should be used to build and move blood, Liv-3 to eliminate stasis etc. However I use an additional acupuncture for alopecia technique called plum blossom needling for these cases. Plum blossom or 7 Star needling is a special acupuncture technique where 7 needles are gathered in a cirlcle and lightly tapped along the skin affected by hair loss. You move from the outer edge of each alopecia patch towards the centre, in a clockwise direction. This Acupuncture for alopecia technique is applied lightly, rapidly, and accurately until flushing appeared twice per week. Research has shown that acupuncture promotes blood circulation, especially to the skin. As soon as blood flow increases, nutrient levels at different areas of the skin are replenished to encourage hair growth. Additional research demonstrates that acupuncture regulates the neuroendocrine system and benefits the immune system. It was also concluded that acupuncture is safe and effective for alopecia areata treatment when it is combined with the Huoxue Shengfa decoction. In the article above I've given you a great overview of how treatment for Alopecia works and the incredible level of success achievable. If you're suffering from hair loss - this is what you need to do next! Start making some of the dietary changes I've mentioned above. Schedule a free 15 minute online consultation with me so I can personally figure out your next best step to getting your hair back. McElwee, Kevin J.; Boggess, Dawnalyn; Olivry, Thierry; Oliver, Roy F.; Whiting, David; Tobin, Desmond J.; Bystryn, Jean-Claude; King, Jr., Lloyd E.; Sundberg, John P. (1998). "Comparison of Alopecia areata in Human and Nonhuman Mammalian Species". Pathobiology 66 (2): 90–107. doi:10.1159/000028002. PMID 9645633. Skin Conditions: Alopecia Areata. WebMD. Retrieved on December 2, 2007.